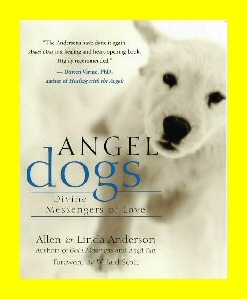 sharing stories from Angel Dogs: Divine Messengers of Love. You already know dogs are healing and loving companions, but did you know they also serve as matchmakers, lifesavers, prisoner rehabilitation specialists, parent trainers, hospital welcoming committees, advice columnists, and afterlife ambassadors? The true stories in Angel Dogs celebrate the deep and ancient connection between people and dogs and will inspire you to live up to the divine example of your canine companions. Stories include an adopted dog who saved the life of a newborn baby (this story and dog were featured on The Montel Show). A dog named Freckles helped guard Air Force One and saved the career of a decorated officer. A Marine's dog miraculously brought honor to a fallen soldier. An empathic dog took on his friend's pain even though they were miles away from each other. A beloved dog made one last visit to a grieving man before leaving this earth. Death-row dogs turned around the lives of the minimum-security prisoners who trained them. Sixty stories of dogs offering compassion and love that will make you want to hug the next dog you meet. 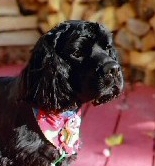 Plus, at the end of each chapter, an 'advice column' written by the Andersons' dog, Taylor. She answers the questions you've always wanted to know about dogs! The book also details new scientific findings on how dogs can save lives, sniff out cancerous tumors, and warn epileptics of impending seizures. Each story is followed by a short meditation that helps readers focus on the messages of love that dogs bring to their lives. Visit the Angel Animals Network at www.angelanimals.net. Angel Animals® Network Copyright © 2002-2013. All rights reserved. The term Angel Dogs ™ is a trademark term. "Dogs are kissing, tail-wagging, life-affirming healers." "I love Angel Dogs. Its stories and messages will amaze and delight you. Allen and Linda Anderson's book will make a wonderful gift for all your dog-loving friends, for anyone who is considering adopting or rescuing a dog, and for those who have lost a beloved dog. Read it and marvel at what the world looks like through the eyes of some of God's most loving creatures." "The Andersons have done it again! Angel Dogs is a healing and heart-opening book. Highly recommended." "The wonderful stories in this book not only made me laugh and cry but also reaffirmed my feelings about the spiritual nature of dogs." © Dogs palace copyright all rights reserve.